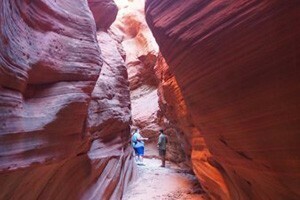 Echo Canyon is a classic slot canyon, with narrow passages and sandstone walls rising high above. With a canyon rating of 3B II, the trek is available to intermediate groups of six or less. 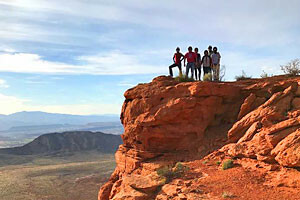 Following part of the East Rim Trail, canyoneers exit the narrow canyon to the surprise of regular hikers. Echo Canyon is located right in the heart of Zion National Park, easily accessible from the main road, and contains many classic features of Zion slot canyons, all within a half-day's adventure. With its tight walls closing above Echo Canyon, Zion displays a subterranean quality, with cold, deep pools of water that last throughout summer, making a wetsuit necessary even on the hottest of days. Rappels may be short, but they can have odd starts, and several of them end directly in the water, raising the degree of technical difficulty. The canyon is able to be explored without the technical gear and knowledge by heading up from the canyon's exit at Echo Canyon Trail. There is scrambling, swimming and downclimbing, but no rappels are necessary for the 3-4 hour hike, turning around at Echo Chamber. Echo Canyon Trail is one of the oldest paths into Zion Canyon, being used initially by Native Americans before being expanded in 1896 for the creation of a lumber mill and cable into the canyon. The lumber was used to build Zion Lodge, among other things. A backcountry permit is required for access into Echo Canyon, Utah, so be sure to make a reservation online at http://zionpermits.nps.gov/ or call (435) 772-0170 for more information.